Chili Baked Potato with Cheese | Naturally. Growing up the way I did, on a good amount of junk food, I still have cravings. No matter how many salads or vegetables I eat, on occasion I get a craving for something greasy. Sometimes, I cave and order out but other times, I want to make something that only seems like it would be greasy and delicious. That’s where this chili baked potato comes into play. This potato is smothered in my favorite bulgur chili recipe and then topped with a drizzle of cheese. It’s perfect for those nights when you want something hearty but don’t want something greasy. Preheat oven to 435˚. Rinse off the outside of the potatoes, prick a few times with a fork, and place in the oven. Bake until potatoes are cooked through, 45 to 55 minutes depending on the size of the potato. While potatoes bake, prepare chili according to instructions. In a small sauce pan, combine cheddar cheese and cornstarch. Heat over medium low and stir until cheddar begins to melt. Add 1/4 cup milk, paprika, and garlic powder, stir until mixture comes together. Add more milk if needed to reach a pourable consistency. Cut the potatoes in half, mashing the potato slightly and top with a few ladles of chili and a drizzle of cheddar cheese. + Recipe is good for two very hungry people or upwards of four kind of hungry people. 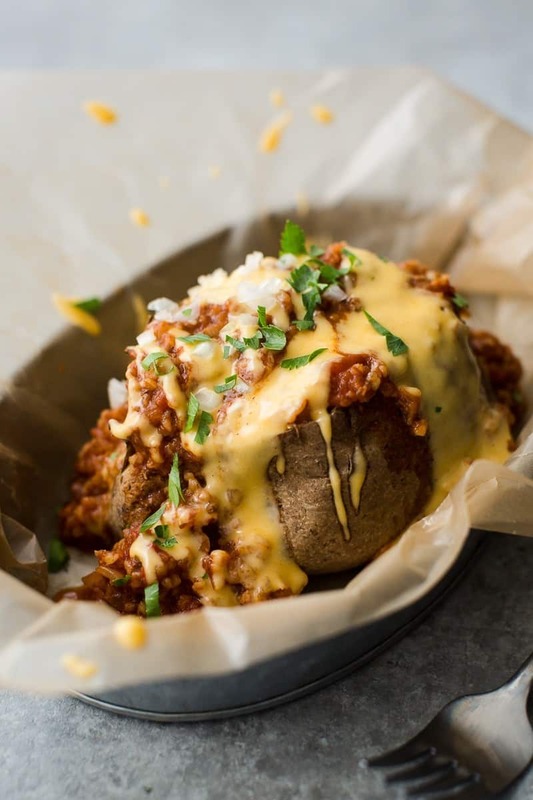 There are a few different ways you could make this chili baked potato depending what you had on hand or your favorite ingredients or chili recipe. Of course, if you’re still on the search for a perfect vegetarian chili recipe, I highly recommend the bulgur chili linked to above. 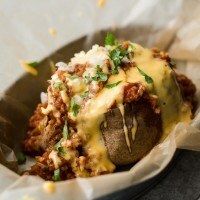 Potato: I’m a sucker for a traditional baked potato but a baked sweet potato would be fantastic smothered in chili (or even sweet potato fries, like these loaded ones). Gluten-Free: If you’re hoping to keep this gluten-free, I recommend another solid vegetarian chili that is gluten-free. Vegan: I’m really picky about my cheese and will rarely eat vegan cheeses, but this butternut queso is the best alternative I’ve found. Oh my god that looks absolutely stunning. Oh how much I wish I could have this right now!! That looks killer! yummy in my tummy!! This looks so yummy! And would definitely curb any cravings for junk food. I agree with you. Sometimes you just want ‘junk’ food. Chili, cheese, and potatoes. Three of the best comfort foods around. I will be making this on the weekend. Yum. This recipe is really looks yummy and divine to eat. No one restrict ourself from tasting this. Mind blowing recipe. Big Thanks to blogger for sharing this.